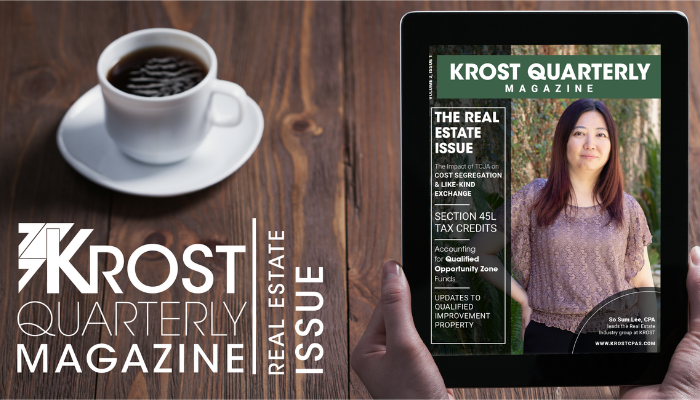 KROST Quarterly: The Real Estate Issue Is Now Available! We are happy to announce the release of our third quarterly magazine! The Real Estate Issue highlights some of the hot topics in real estate including Opportunity Zones, Delaware Statutory Trusts, Cost Segregation, 1031 Exchange, Green Building Tax Incentives, and Qualified Improvement Property. So Sum Lee, CPA is a Principal at KROST. She has over 18 years of experience in public accounting and has a wide range of experience in Auditing, Accounting, and Taxation, and is also the head of our Real Estate industry niche. So Sum has a degree in Business Economics with a minor in Accounting from the University of California, Los Angeles. She is also a member of the American Institute of Certified Public Accountants and the California Society of Certified Public Accountants. Keith Hamasaki, CPA is an Assurance & Advisory Director at KROST. As a trusted advisor with over a decade of experience, Keith specializes in audit and business advisory services to emerging and middle market companies. Jonathan Louie, CPA is a Tax Manager at KROST and has over 11 years of experience in public accounting. Prior to joining our firm, Jonathan serviced high net worth musicians and entertainers working for a mid-sized business management CPA firm in Encino, California.